The light blue patches are where you will be allowed to live if you are in America (I have not seen similar maps for countries elsewhere, but this is a UN agenda, so not exclusive to the United States). The red areas are areas where there will be ‘little or no human use’ allowed – in other words these are wildlife only zones. Can you see how Agenda 21 puts you below creation – the opposite of God’s plan for you? Ok, so having watched that you have a pretty clear idea that this agenda is not for your benefit. It is not to help you at all. 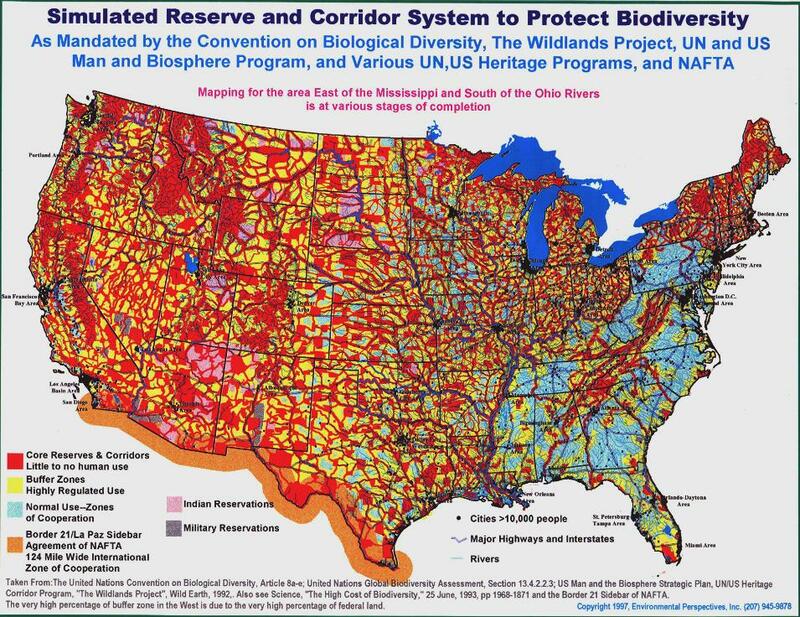 As UN Agenda 21 has got out there – people have begun to hear about it and find out about it, they have begun to use different names to cover up the fact that policies are following this agenda without local agreement. … “they don’t call it Agenda 21 anymore. That term has been thoroughly demonized by so called “conspiracy theorists” and caries a lot of baggage. No, the government’s plan to relocate rural residents will be conducted under another name. “An author for the thedailyherb.com recently stumbled upon a very interesting article written in 1998, for a local newspaper in Montana. It was written in part, to expose a plan made by the Montana Department of Fish, Wildlife, and Parks, to try and relocate rural populations into the cities. Please watch what your local authority is doing – please keep your eyes open for words like ‘sustainability’ in planning documents. Please watch out for public meetings. Please get active. In the UK you can download a helpful guide prepared by the people at the UKColumn.org and here is the direct link to the document: Link Please also visit their site and support their work. The plan is depopulation. The plan is sweatshop towns, rabbit hutch homes and a completely oppressed, surveilled and controlled populous. The CORRUPT U.N. is Anti-Israel-Yisrael / Anti-Zionism / Very Antisemitism / Anti-Christian and Jewish People / Anti-USA Everything!! I agree – I believe we in the UK have been given a false choice to leave the EU when we really need to leave the UN! No one even talks about that here.